For many years this site had a forum. It was PHPBB based, an older version. Not much traffic, mostly news from me (which is now also here) and some posts already added to the pages of the site. Thank you for the contributions and the Contact page is always available for your questions and contributions! Fixed the Beta download links! Hopefully no one has seen it, it took less than a day and night to move all my hansotten.nl websites to another provider. All seems well, but if you spot a problem, please tell me! The conversion of the old website is now finished and its mobile friendly! And at least on a modern and easy to maintain WordPress base. Now ready to add more info and play with my KIM-1 and Apple 1’s! And the DOS65 systems just beg to be documented .. If you use the Contact from your IP and email address and remark is recorded in an email sent to the site owner. This information is only used to answer, by email, your optional question in your remark and always deleted immediately afterwards. Welcome to the Retro website! This website is now being transformed into a WordPress site. Responsive, modern, safe, easy to maintain, but with the same contents. It is also a good opportunity to weed out errors and enhance the site even more. Also the site changed from pure SBC to more general microprocessor and related electronics with the addition of magazine articles from Radio Bulletin and Elektuur. Very few systems were build with a 6501. The Digital Group did, see here! 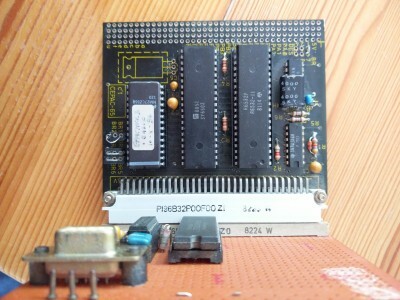 Australian Z80 system, described in the magazine Talking Electronics. I will start building a TEC-1D! 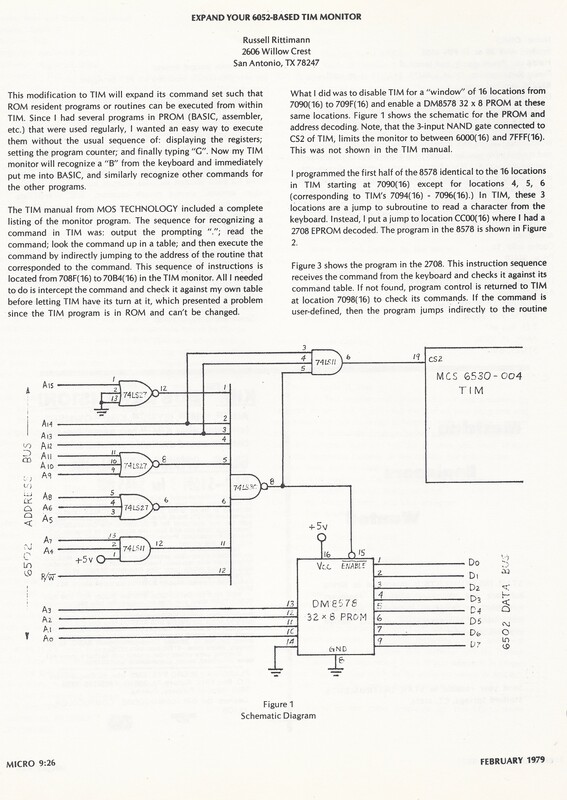 A new page on the SBC's MPS-65 and CT-65. With photo's, information, manual and disassembly of the system ROM. New IC's in to the collection! 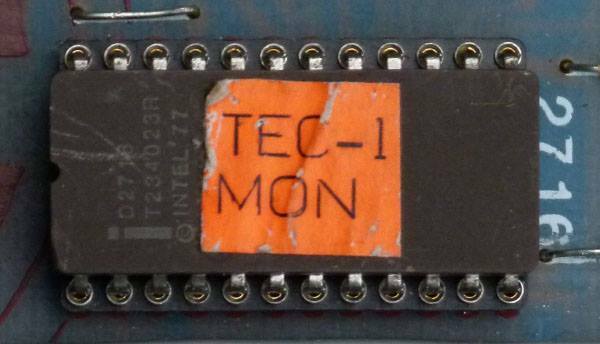 An article from Micro February 1979 shows how to enhance the TIM monitor. Two IC's 65C102 added to the IC collection. Rockwell, 8639 and 9009 date codes. I got hold of a rare 65c802 and some NOS 6504 and 6507's. 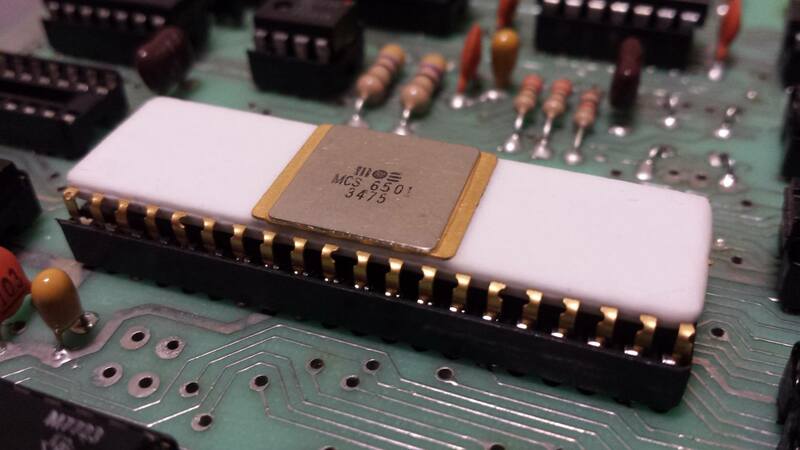 In the 65XX IC gallery now photos! 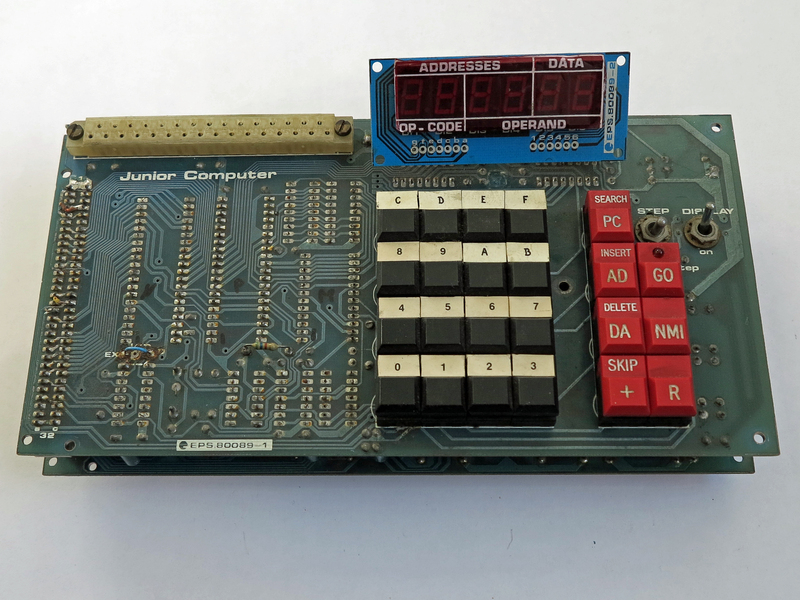 This page is about retro 8-bit small computer systems computing and electronics. And the role of dutch electronic magazines like Elektuur and Radio Bulletin in the 80ties of the 20th century. Also the dutch userclub, called KIM Gebruikersclub, which I joined in 1978 and contributed to as member of the board and as chief editor of the magazine issue 11 to 25. The retro computing pages are documenting my experiences with 8-bit systems like the KIM-1 and its relatives such as the Apple 1 and the Junior. In the early days of computing, magazines about popular electronics played a big role in making microprocessors available for the beginner, whether the professional or hobby electric engineer. The magazines featured here are the dutch magazines Elektuur and Radio Bulletin. From 1977 and 1996 I worked as technical editor for Radio Bulletin and published about microcomputers and more general elektronics. Elektuur published also articles on these subjects, many are available here. What is a SBC for me? 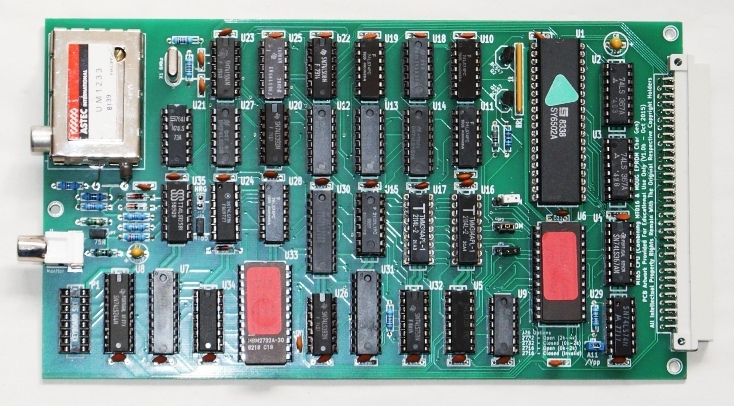 A SBC, short for Single Board Computer can be defined as a computer system, based on a microprocessor, on one printed circuit, with keyboard and display, programmable I/O ports, expansion connectors and without a casing. 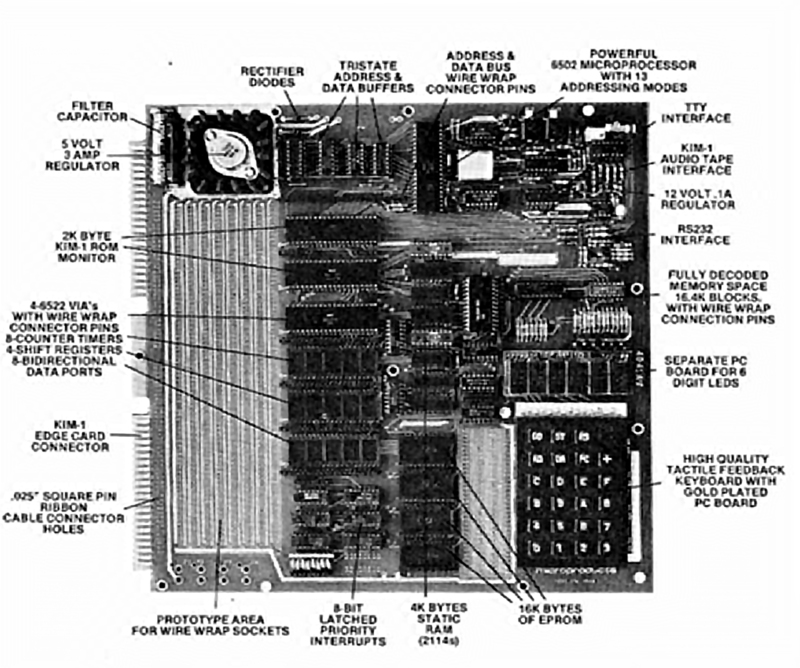 The ‘operating system’ is stored in a (EP)ROM, an often small amount of RAM is available to store programs and data These were the first microprocessor based computers with affordable prices for hobbyists in the late seventies of the previous century. 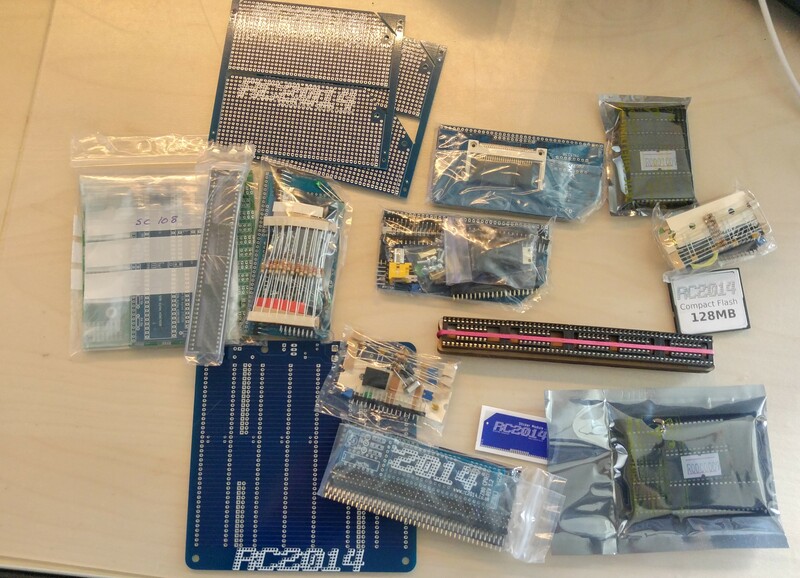 For professionals a way of getting acquainted with the new hardware and learning the basics of programming at a (very!) low level. Though it is a complete computer, it has a CPU, memory and I/O, it is also a very limited one. The I/O is often not more than a small keyboard with hexadecimal functions. The display is often not more than 6 or 8 seven segment LED displays, just enough to show, in hexadecimal format, addresses and data. The operating system allows entering and examining of data in memory locations, and start and stop a program. Loading and saving data is limited to either papertape readers and punches, quite common in these days, or via some modulation as data files on audio cassette recorders. Also common is the ability to attach a teletype like the ASR33. 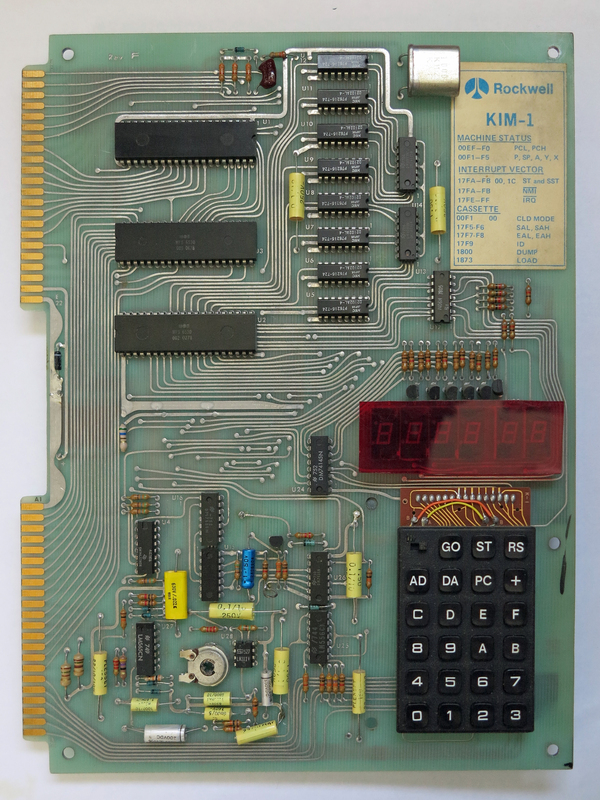 A good example of such a SBC is the KIM-1, shown below. 2K ROM, 1K RAM, many I/O lines free, six LED displays and a keyboard with hexadecimal keys and some function keys. Why these SBCs like the KIM-1 became so popular? One reason was the low price ($ 280 for a KIM-1, I paid 795 guilders ), so it was in the price range of the average student and hobbyist. Another is the design being open, the complete hardware description and detailed listing of the ROM was included. And it is not the frightening computer, but more a programmable piece of hardware. Because it was so easy accessible and low speed, adding and changing hardware is not hard also. Programming was not easy, but editors/assemblers that could run with some added hardware like RAM and a video terminal made that possible. The nowadays common practice of cross compiling was not available for the hobbyist then. 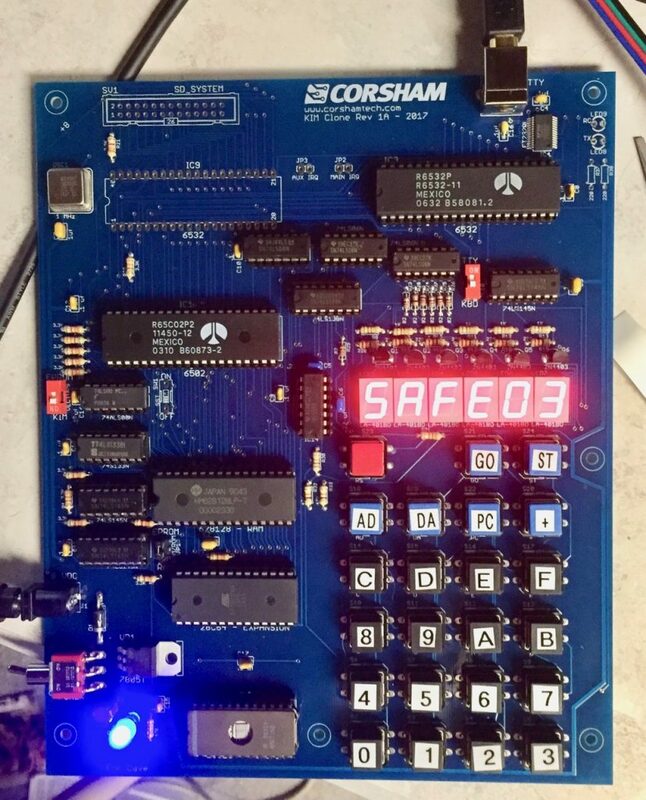 Besides playing with the SBC, to learn what the microprocessor is capable of, many SBC’s were put to work as a sort of PLC, controlling devices in the real world. What changed the popularity of SBCs was the wish to transfer it to a computer with a better user interface, like graphics on a video screen, a full blown keyboard, a real operating system with mass storage such as floppy drives, and a higher fun factor, a.k.a. games. Or to make it a serious computer fit for business. 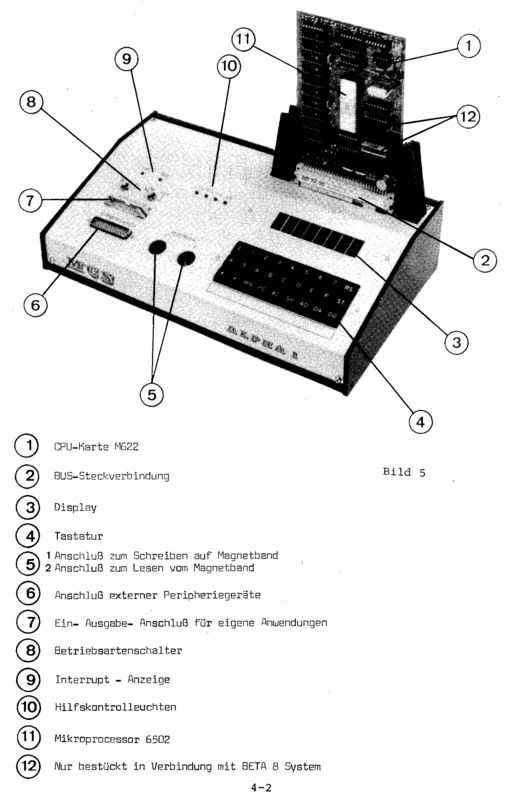 So SBC’s became extinct fast in the mainstream hobby world when the hobbycomputer appeared on the market, like the TRS-80, PET and later the C-64, MSX etc. Even later the boring business PC killed the hobby computer, but that is another story. It seems the SBC’s are back though: Arduino and Raspberry Pi and the availability of cheap Chinese electronic shops and cross compilation on the PC make it possible to play affordable with small programmable devices at a lower level. 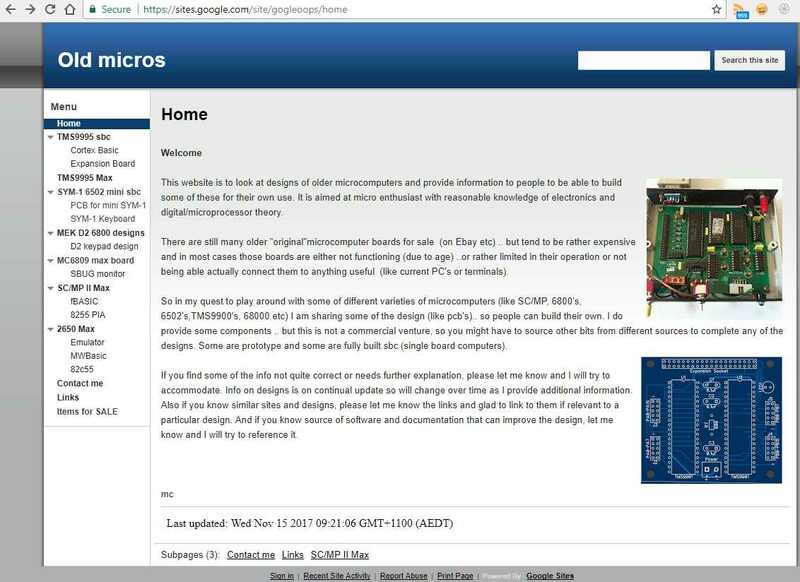 This site is mostly specialized on the 6502 SBC (Single Board Computer), small computers based on an 8 bit microprocessor. Good for learning about digital electronics and programming at a lower level. And for many the start of their career in computer science. 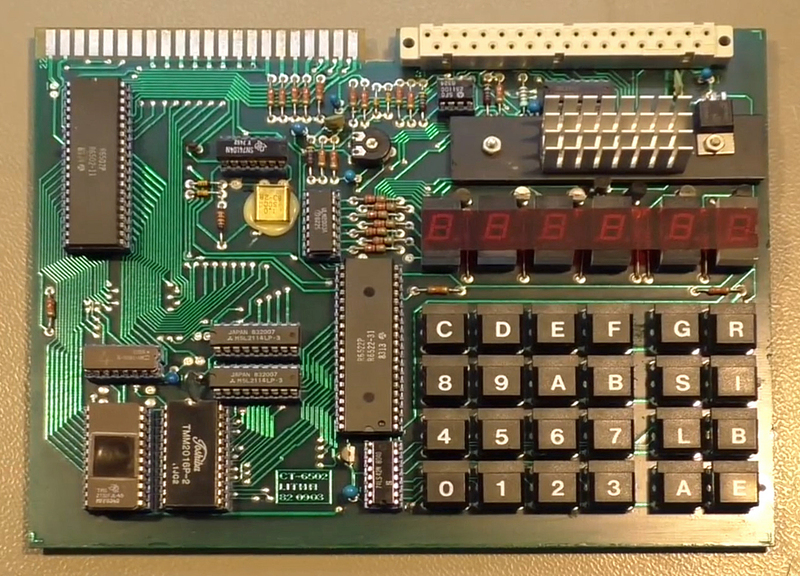 SBCs featured here are systems like KIM-1, Apple 1 and equivalent boards like the A-ONE, Apple 1 Replica, Micro-KIM, Elektor Junior, AIM-65, SYM-1 and such. Please use the Contact form to contribute to this fascinating hobby!